courage of having done the thing before. 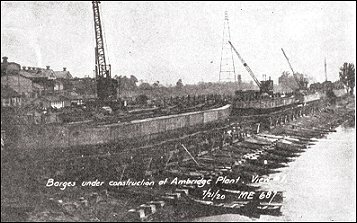 The American Bridge Company had an early start building river barges. This 1920 photo shows the riverside operations. 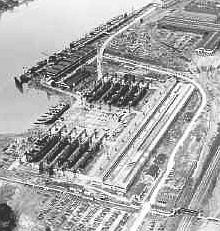 During World War II, these facilities would be part of the national war production effort. LST's (Landing Ship Tanks) would be leave from here and sail though the Ohio and Mississippi River systems to join in the European and Pacific invasions. 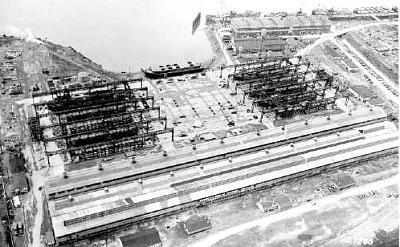 In the photos below, the two outer rows held the ships in various stages of completion. The structures supported overhead cranes used for moving the steel parts. When the LST was near launch condition, it was moved to the center area and then to the river bank where the finishing touches were added. Once production started, the Bridge Company launched an LST every fourteen days. The next page has closer views.